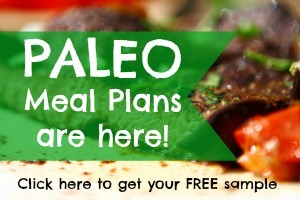 One thing is for sure, people following a low carb or Paleo diet LOVE bacon. I recently found a great source of fresh pastured bacon from a local farm and it got me thinking about what is the best way to cook bacon. 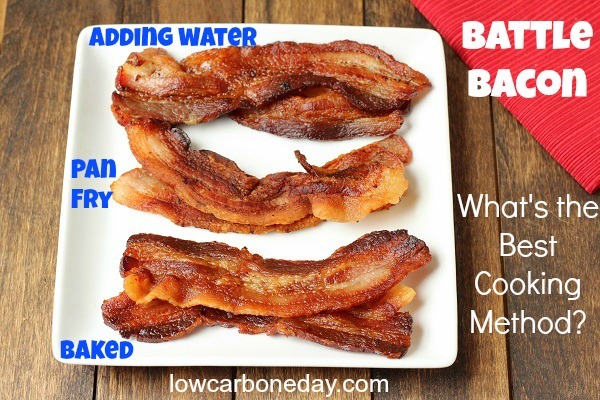 Of course pan frying the bacon is a classic method, but recently I’ve seen lot of people talking about oven baked bacon and adding water to cook bacon. Oven baked bacon has been the way I’ve cooked my bacon from that last six months or so. I love it because you don’t have to watch over it while it’s cooking. But this “new kid on the block” (for me anyway) of adding water to skillet when you cook bacon sounded so bizarre to me. I just knew I had to give these three ways to cook bacon a try for myself to see which method I would use for all of my bacon needs. Directions: Add strips of bacon into a large skillet so that they do not overlap. Place the skillet over medium heat and cook the bacon for about 8-10 minutes or until crisp on one side. Flip the bacon over and cook for another 5-6 minutes or until crisp. Remove the bacon from the skillet and lay on paper towel to drain. Pros: Nothing wakes up your senses more than the sounds of bacon frying on the stove top. Plus you get to pour the cooled bacon renderings in a jar and save it for cooking your eggs, veggies, etc. Cons: This technique needs almost constant attention and there is lots of popping grease. You have to me careful so you don’t get splattered. Also, it’s very easy for the bacon to go from crisp to burnt in a matter of seconds and this method is prone to uneven cooking. The bacon is always crispy with no chew to it, so if you prefer a chewy texture this method isn’t for you. Directions: Place the bacon on a foil lined baking sheet (or a slotted baking sheet if you have it) and place it into the oven (start with a cold oven). Turn on the oven to 400 F and bake for 15-17 minutes or until the bacon is cooked through. If not using a slotted baking sheet, remove the bacon from the pan and lay on a paper towel to drain. Pros: No need to “babysit” the bacon while it is cooking. Fairly even cooking, but may need to rotate the pan if your oven doesn’t cook evenly. Easy to pour the cooled renderings into a jar for use in cooking. Cons: No crispiness…just chewy. The only crispy pieces seem to happen when the bacon is left in the oven too long and starts to burn. This method can be a little messy with the baking sheet full of the bacon renderings. It may not be the best method during the summertime because it requires heating up your oven (and probably your house). Directions: Add strips of bacon into a large skillet so that they do not overlap. Add enough water to cover the bacon. Cook over high heat and allow the water to boil. Boil for 5-10 mins or until the water has mostly boiled out. Reduce the heat to medium and cook for another minute or two per side or until the bacon is cooked through. Pros: No need to “babysit” the pan for the first 5-10 minutes while the water is boiling (of course keep an eye on it). Cooking the bacon this way allows the fat to slowly render and the bacon to cook evenly. The result is crispy bacon with a slightly chewy texture. Cons: The fat is rendered into the water leaving less grease so it can’t be saved for other cooking. You also need to pay close attention to the bacon once the water boils off so it doesn’t burn. What’s the Best Way to Cook Bacon? I’m a little torn, I love oven baking because I can throw it in the oven and come back to perfectly cooked bacon in 15-17 minutes and this has been my go to method for cooking bacon for awhile. This adding water new comer gives oven baked bacon a run for it’s money. The water cooked bacon had a crispy texture with a slight chew to it. For me that is the perfect way to serve bacon. I will definitely be using the water method during the summer so I don’t have to heat up my oven during the hot summer months.